Thursday, May 9, 2019, 3:30 – 5:30 p.m.
An artists' roundtable focused on Indigenous knowledge, methods and worldviews, not simply as tools of resistance or intervention but because these are fundamentally valuable to our world. Engaging the conversation are Gregg Deal and honored local artists Storme Webber, RYAN! Fedderson and Dåkot-ta Alcantara-Camacho. The free public event takes place at North Creek Events Center. With the plan to seat audience in concentric circles radiating out from the talk circle of guest artists at center, this in-the-round event invites audience members to actively listen and/or participate when prompted. 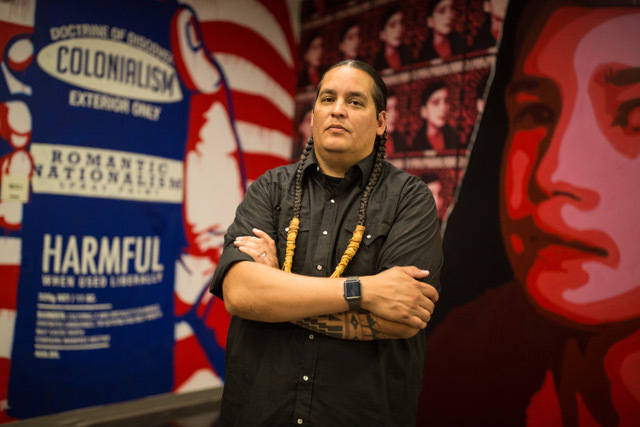 Gregg Deal (Pyramid Lake Paiute Tribe) is a provocative contemporary artist who challenges Western perceptions of Indigenous people, touching on issues of race, history and stereotypes. Through his work—paintings, murals, performance art, filmmaking and spoken word—Deal critically examines issues and tells stories of decolonization and appropriation that affect Indian country. Deal’s activism exists in his art, as well as his participation in political movements. Dåkot-ta Alcantara-Camacho was raised in Tscha-kole-chy (Whidbey Island), with lineage from Låguas yan Gåni. A First Wave Hip-Hop Scholar, Dåkot-ta holds a BA in Gender Studies (University of Wisconsin-Madison) and MA in Performance Studies (NYU-Tisch). Dåkot-ta’s work spans ritual, performance, installation, and contemporary indigenous movement. Dåkot-ta founded MATAO, an emergent identity/method for indigenizing creativity and creatively indigenizing one's self. RYAN! Feddersen (Okanogan /Arrow Lakes/German/English) is a mixed-media installation artist and 2018 National Fellow with the Native Arts and Cultures Foundation. She specializes in interactive and temporary artworks as ways to honor Indigenous perspectives on artist-community relations, including exhibitions at Tacoma Art Museum, MoPOP, Henry Gallery and Museum of Northwest Art. Storme Webber is a Two Spirit Sugpiaq/Black/Choctaw poet and interdisciplinary artist. Her work incorporates text, performance, audio and altar installation, archival photographs and collaboration, engaging ideas of history, lineage, gender, race and sexuality. Her practice explores liminal identities, survivance and decolonization, in a blues-based experimental manner, often incorporating acapella vocals.